Random Post: Does Your Brand Speak For Itself? Privacy is, and always has been, something that needs to be taken very seriously. People will only return to or do business with sites they trust. This means that while a website can track everything, it does not mean that it should. In fact, several large media sites have recently been sued over the use of “flash cookies”, which can be used to identify returning site visitors even after the user has deleted their standard cookies. Originally written for Catalyst, reposted here with permission. Recently within the #measure community there has been much talk about Google launching https://www.google.com which is an SSL version of Google search. The big issue is that when a user clicks through a search result the referring site is stripped off and there is no way for the destination site to tell what keyword was used. What will happen next depends on who you talk to. Perhaps this means that businesses don’t know what is driving traffic to their site (via natural/organic search) so they will not want to spend ad dollars on keywords that may or may not be used frequently by their visitors. Maybe businesses switch spending to a different service, such as Bing, where they can feel more comfortable knowing what they are spending on. For the web analysts, like myself, there is the issue about where the traffic shows up in marketing channel reporting. We will no longer know how much traffic Google is driving to our sites. Since Google is such a major player in the search game this could be a huge issue. But there is one problem with all of this. While I – as a web analyst – care about this, I – as a customer, as a searcher – don’t give a crap what a company does or doesn’t get. That’s their problem to work out. In fact, with all the talk about privacy from all the Facebook changes, as a searcher I would be happy with any new security Google can provide for me. So this means that the users of search are not going to drive Google away from defaulting to SSL searches and perhaps do the opposite and attract more pepole. That only leaves the businesses paying for advertising, but they hardly have any strength at all. Really, it just means businesses will not spend money as efficiently as they could be so they would have to buy more keywords or risk lost revenue from lack of paid traffic. Searching over SSL doesn’t reduce the data sent to Google — it only hides that data from third parties who seek it. You see where I’m going with this? Google could start charging for access to the natural search. This is sold to senior leadership at businesses by stressing that without the data the company 1) won’t know what is driving search traffic to the site and 2) won’t be able to spend their search advertising dollars efficiently. It is a grand slam for Google. Furthermore, before you get up in arms about the thought of paying for this data, have you ever used Acxiom data to gather targeting information on customers you otherwise know nothing about? If you’re not in the direct mail space, then what about Hitwise or Comscore? All of that is the same thing. Nielsen Ratings? Same thing. Just a company collecting (or buying) massive amounts of data and packaging and selling that data to clients. At the end of the day businesses simply cannot afford to say “screw Google, we’ll buy ads elsewhere”. They will pay for this data, and probably line up to do it (after the mandatory complaining about how they used to get it free). We all know that Rupert Murdoch is changing the face of news on the internet by charging for it. There were even talks about making Google pay to index it. Google needs to keep looking for new ways to generate revenue; charging for search data may be it. At the very least it could come free with Google Analytics, giving you one more reason to switch. I bet that wouldn’t make Omniture / Adobe very happy. I think things could get interesting. What do you think? Conversion, however that is defined for a site, is always the reason the site exists. For me, a conversion is a visitor viewing at least 2 pages. If I can do that then I know that I have engaged the person enough to look around the site a bit more. You probably have some other definition of a successful conversion on your site. A fairly common conversion point for a website is account creation or e-mail capture (e-mail sign-up). The most common way to look at how successful the sign-up process is is by using a fallout report. A nice funnel that shows how many you started with and how many fell out at each step. The bottom of the funnel is the total number of people that made it through the process. This is a great way to look at things but there are two very different ways of doing it. The first way is based on pages viewed. This is a very common way to look at fallout. People that made it from Page A to Page B to Page C. This works nicely in a very straightforward way. It gives you a nice view of the total performance of that site path. Unfortunately, at least in some WA tools, that is about all you can get at with the basic reporting capabilities. The problem with this is that you might be missing some huge cake scraps, or golden nuggets, of information by looking at the data in aggregate. Setting a success event on each of these pages will provide a much greater degree of flexibility. For instance you could very easily look at campaign tracking codes and see how many of each event was set for each tracking code. This might give you information that you simply didn’t have before. Say, for example, that you had both display advertising and paid search campaigns pushing traffic to your site. In all likelihood you know what the conversion is off of each of these tracking codes but you might not know how many of your email sign-ups are coming from each campaign. It is very easy to start setting a success event on the sign-up confirmed page so that now you can get a count of that event by campaign tracking code. Perhaps you find out that your paid search converts better but they don’t come and sign up for email. This might cause you to change the messaging that you are doing in paid search (perhaps message email strong to drive sign-ups or message something else since e-mail sign-up just didn’t work). Similarly, if you had a 2-step process, and set a success event on each page, you would be able to see if one type of campaign had huge sign-up issues. Perhaps you would learn that you want to create a different on-site expirence for that type of campaign to drive up sign-ups. Another thing that is great about using events is that they are easy to trend across time whereas fallout reports based on page views can be a bit more difficult or time consuming to generate. The downside is that you probably have a limited number of events, so use them wisely. What type of conversion goal do you have for your website? I think I am going to try to refocus myself a little bit and talk about my life in the world a web analytics a bit more. This was one of the things that I talked about at the onset of the blog and, while I have made a few posts on WA, I don’t think I did quite enough. I didn’t publish what I was learning. I didn’t take time to look back at what I learned in any given week. Learning happens, often times, in small steps and so if we never take a moment to look back we never realize just how far we have moved. Have you looked back on your acquired knowledge recently? Well, their advertising got me in the door. I decided to check out what this whole cruise thing was all about. It looks like a great time, but I can’t help but think that their User Experience could be significantly improved (and therefore their conversion rate). Carnival is making some HUGE mistakes. The first thing I notice is that I am left to assume that these are per person rates. Maybe it says that somewhere on the rest of the page, but this section is clearly the focus. Making sure your user knows that this is a per person rate will save on hard feelings down then line. After all, I am booking a room and rooms (at hotels) usually don’t care if you have 1 person or 2. If I have never been on a cruise (and I have not) I could easily assume these are rates per room. Update: It does not say that on the page, only when you hover over the lowest price (not shown in picture); does not show up when hovering over any of the other prices. Hmm…the first thing I notice is that I clicked on the Suite and the picture that pops up looks pretty unremarkable for the price. Oh wait, the Interior room is selected. Huh? That seems like a pretty big miss. But okay, I figure that out and click the suite. I give them another chance to sell me on the room. And…it is just an enlarged picture of the little thumbnail. Thus far I am not convinced that I will double the price of my cruise. But what could they do differently? What does the view out the balcony look like? How big is the balcony? What does it look like? Is there a TV (like in the other rooms)? Where is it? How big are the closets? Where are they located? It says it has a large vanity/dressing table…where’s that? A whirlpool tub is listed. Again, what does it look like? How big is the desk in the corner of the room? All of these things are items that people want to know. They want to know what they are getting for their dollar. Instead there is one generic shot that does almost no good. 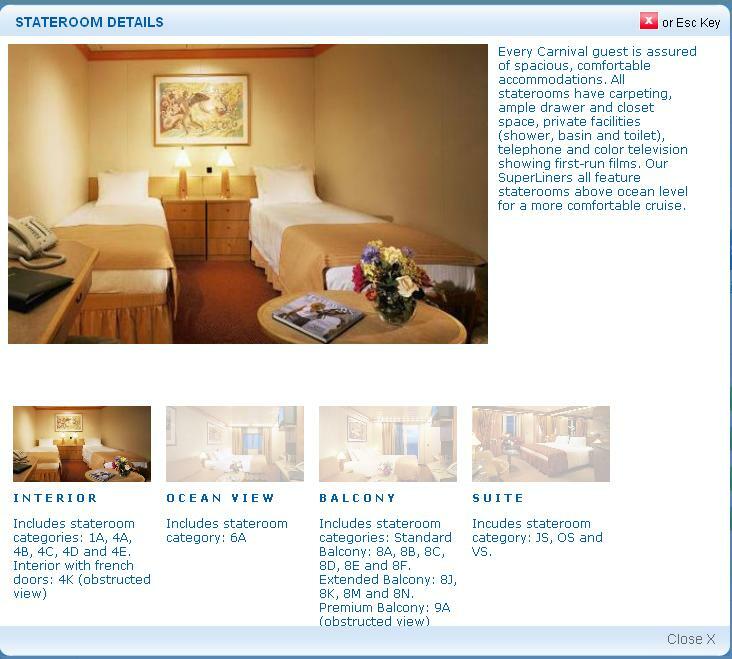 The next things is the text below the single picture: “Includes stateroom category: JS, OS and VS.” Ohh, right. Category JS. I’m not sure what JS means to them but to me it means Jack Squat. Why would these letters have any meaning to me? And, to make matters worse, I cannot click them to figure out what the heck they are talking about. It is just meaningless text unless I’m some sort of cruise expert in which case I wouldn’t be on this page to begin with! Sorry Carnival, I’m not even all that interested in what your big green details button would give me. In any field it is easy to look at day over day comparisons, week over week, month over month, and even year over year. If you are diligent you might even go so far as to trend your data over time. Perhaps you will include a trend for the current time period as well as a trend for the historical time period. The graph will be very pretty I’m sure. That is all great stuff. The problem with all of this is that it is far too easy to get caught looking at the micro picture without ever taking the time to step back to look at the macro picture. Where were you at the pinnacle of your stats? Where were you at the depths? And not just in the time period you are comparing. I am talking about ever. These are the things that you need to be aware of. Not with every project you do, but just in general. This gives you perspective. Have your sales been increasing each year? Great, maybe they have even been increasing for the last 4 years. Even better. But what if you are still at half of your sales from your peak 15 years ago? The company was capable of doing it then. Ask yourself “why are we not at that now?” and then try and figure out how to get there. Don’t be satisfied with being close to the industry average. While it is great to know where and how you tack up against others, it should only be a component of your overall picture. Who cares if you are far above average on conversion? Someone has to shoot for the stars. Somebody has to be the new benchmark. It can be you. The point is that as an analyst, and we are all analysts to greater and lesser extents – in your job or not, you need to be aware of the overall picture. Don’t just be a reporting monkey. Know your stuff. Know what potential there is. And if you are setting a new benchmark, then pat yourself on the back. You deserve it. But then ask, how can I (or we) push that even further. How have you pushed a benchmark in your life? WordPress generated this page with 32 queries, in 0.093 seconds.